This hair oil treatment for dry, damaged hair, with custom-blended Cupuaçu & Brazilnut oil, nourishes and helps repair. Marvelous Oil can be used in any of 5 ways! Try a different use each day. 1. Pre-Shampoo Treatment: Apply to hair (wet or dry) before shampooing to help prime hair locks for gentle cleaning. 2. Boost Conditioning: Add 1 or 2 drops to your conditioner to help get rid of pesky knots and tangles. 3. Blow-Dry Protector: Apply to damp to help protect when blow drying. 4. Finish With Hi-Watt Shine: Apply to damp or dry ends to help smooth split ends and tame flyaways. 5. Treat Hair Overnight: To restore softness while you sleep, work into wet or dry hair and leave in overnight. Rated 5 out of 5 by CAHD from Why mess with a great thing??? Cannot believe you discontinued this item, please please bring it back!! My daughter, her friend, and I all love this product!! So disappointed that obviously so many people love it and you got rid of it!! Rated 5 out of 5 by Crispy16 from Please bring this product back! This was a great product for me, and based on all the other comments a lot of other people. Please consider bringing it back! Rated 5 out of 5 by BCrocks2010 from This oil is/was incredible Please reconsider this product. It’s the best. I have wavy hair and I color it. This product was the greatest at restoring moisture to my hair. Say it isn’t so. Please don’t discontinue!! Rated 5 out of 5 by Carol23 from Great product! How can it be gone! Maybe it took a while to catch on? For me, I bought it for my son to try about 2 years ago. He has thick wavy hair that tends to frizz in the summer. Being a guy, he didn't try it. I came across it earlier this year in the closet and, even though my hair is fairly straight, it still has a few unwelcome waves and frizzy spots. Well, my hair has never been so soft to the touch or so easy to smooth. I recommended it to a friend who has a big frizz problem in the summer and when we couldn't find it in the stores I got her a bottle from Amazon and learned it is no longer made. I'm devastated for both of us - me for loosing the soft, silky hair and for her lossing the control she finally got. 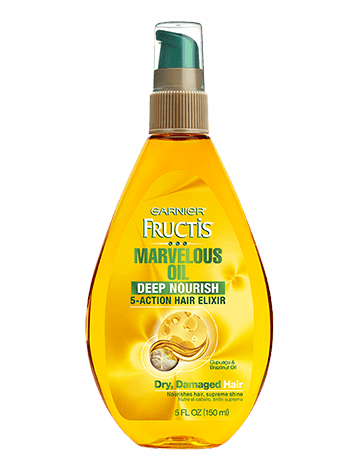 I have 2 other Garnier Oil products sitting on my shelf and neither are nearly as good as Mavelous Oil. I think it should be put back on the production line. I know at least 3 more people that could really use it. And they problem know 4 more, and so on, and so on. Rated 5 out of 5 by Becca1 from I AM DEVASTATED THIS WAS DISCONTINUED I have been using the same bottle of this product for almost five years because I only used a little bit, and I finally just ran out and find out that it is discontinued. I am devastated, it make my hair beautiful and soft. My life is ruined and I don't know what to do. Rated 5 out of 5 by CleoK from Better than Phyto This was an amazing product. The replacment with olive is not as good. Why was this discontinued? I would have paid twice as much for it if the cost of the ingredients went up. It was light yet kept my hair silky and never oily. I have fine dry naturally wavy hair. The scent was nice but never overpowered other products. I find the new version with olive oil to be heavier and it leftnmy hair smelling like olive oil after a few hours...not pleasant. Returned it. Will not be trying another Garnier product unless they bring back this formula. Buying what can find of the original online. I am used to spending a lot of $$ on hair products. For a short while you had me believing in your products. Very disappointed in GARNIER. Rated 5 out of 5 by Angelwingsx2 from I'm missing you already I have just almost finished my second bottle of Oil Deep Nourish.My hair was so unmanageable and dry,after trying everything else,this was the only treatment that worked for me.Now you are saying it is dis-continued,I'm lost because I thought I had struck Gold when I found this oil nourish treatment.Now what do I do?Do you any left after the discontinue product that I may have one?I really would like to keep using this a little while longer while it's finally making my Hair feel like Hair.Very soft and smooth with a beautiful shine,that is what this oil treatment does for me,now you are pulling the plug on it,so sad,especially for me.